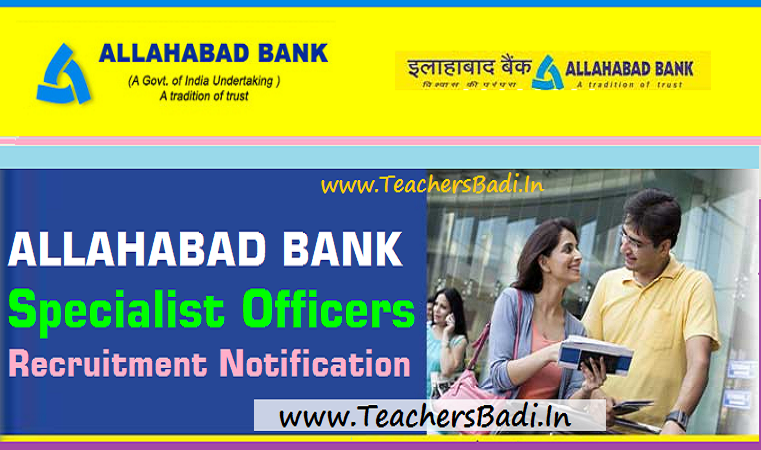 Allahabad Bank Specialist Officers Recruitment 2019 notification: Allahabad Bank has published notification for the recruitment of Specialist Officer Posts and Allahabad Bank invites Online Applications for recruitment to the posts of 92 Specialist Officers. Candidates are required to apply online through Bank’s website www.allahabadbank.in. Allahabad Bank begins the process for recruitment of Specialist Officers. The bank is inviting online applications for recruitment of 92 posts in various specialized fields. Interested candidates can apply through online mode by visiting the official website of Allahabad Bank, allahabadbank.in. Online Registration of application on bank’s website commenced from April 29, 2019 and will continue till April 29, 2019. Candidates are required to pay the application fee online. Fee payment on the official website of the bank will start from April 9, 2019 and will end on April 29, 2019. Candidates are required to pay a fee amount of Rs 600 for the application. The candidates’ age should be minimum 20 years and maximum 35 years. The minimum age for the post of Manager (Equity/Mutual Fund Desk) is 24 years. For the post of Company Secretary, the minimum age is 21 years. Candidates can check minimum education qualification and other eligibility criterions at the official website. Candidates are advised to go through the advertisement available on the website before applying for the post. The candidates will be selected through an online test and Interview the dates of which are not yet announced. Age Limit: 20 to 35 years as on 01.04.2019. Step 11. Chose the Payment Mode Online and click on the ‘Submit’ button. Step 12. Candidate must note that no change is permitted once the payment mode is chosen.